Are You Working as a Team or Alone? Have you ever experienced doing a job by yourself and one day someone comes along to help you? You didn’t realize how much you needed help until some one started helping you and made your job easier. Whether it’s in your marriage, ministry or a mission that you need to accomplish at work, we all must learn the value of team work. A team is defined as a number of persons associated in some joint action. I was in a meeting yesterday and being a good team player was discussed. T.E.A.M. was defined as “Together, Everyone Achieves More!” I thought, this is so true and immediately applied this to marriage. 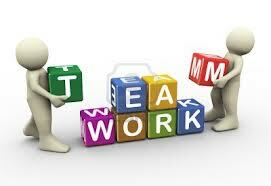 Imagine how much easier things would be if every husband and every wife worked together as a team. Team work makes the dream work! Are you and your spouse working together or working separately? Have you shared your goals and dreams so that both are clear on what needs to be accomplished? If you are not married pray about opportunities for God to use you in your singleness. Ecclesiastes 4:9-12 says Two are better than one. There are benefits to working together as a team. God doesn’t intend for us to make it on our own. He is a relational God and he expects us to be in relationship with others. When there is more than one, one can help the other one up. Also, defeat is unlikely when there is more than one. A person is more likely to succeed when they have help. A job can take less time when there is help. So don’t try to do everything alone. Pray and be willing to work together as a team to accomplish the dreams that God has given you. Everybody needs somebody!